Distinctive features: Uses the first Texas Instruments "calculator-on-a-Chip", the TMS1802. Has a Texas Instruments "Klixon" keypad. Main integrated circuit - Texas Instruments TMS1802 (here date coded 7207). 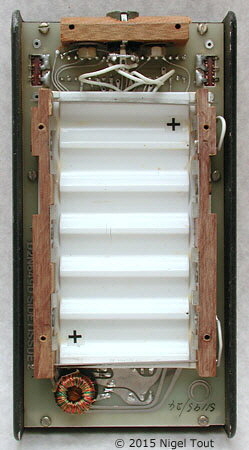 7.2 v (6x AA replaceable cells). Country of manufacture unknown. The logo on the calculator is that of Texet, a calculator and office equipment marketing company based in Manchester, England. This calculator is a little unusual, having features of an early low-volume calculator before mass production took over. It is solidly made with a metallic body, "Klixon" keyboard, uses shaped pieces of phenolic plastic, and has a very unusual multi-pin socket for an external power supply. 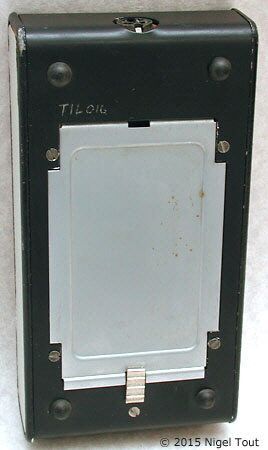 A similar looking machine, using the slightly later TI TMS 0103NC integrated circuit is shown at http://www.computermuseum.org.uk/fixed_pages/ti_texet_1.html where it is suggested that it was made from a kit. If you have further information about this model please get in touch. For more early Texet calculators see the Texet page on the British Vintage Calculators site. 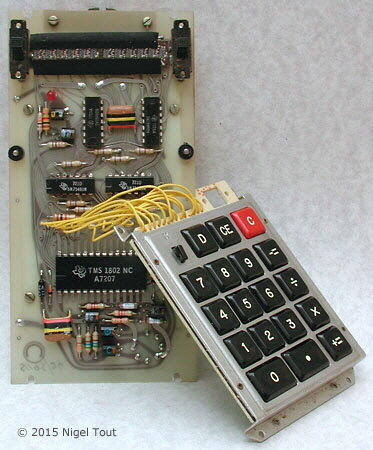 Through the latter part of the 1960s and the first years of the 1970s the aim of the calculator manufacturers was to reduce the electronics parts count required to make a calculator. The ultimate aim was the "Calculator-on-a-chip" - that is a single chip which performs all of the functions of a calculator. in its simplest form addition, subtraction, multiplication, and division. The first semiconductor manufacturer to achieve this was Mostek, in late 1970, with the MK6010 which was immediately put to use in the Busicom Junior small desktop calculator and the Busicom LE-120, the first pocket-sized calculator. 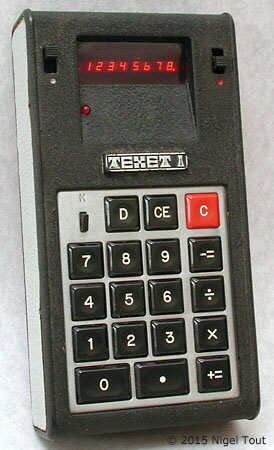 In Summer 1971 Texas Instruments introduced its "calculator-on-a-chip", the TMS1802 used in the Texet 1, here. See also the article "The Calculator-on-a-Chip" on this site. For further information on the development of electronics for hand-held calculators see the article on this site "The Story of the Race to Develop the Pocket Electronic Calculator". The rear of the calculator with the battery compartment cover is a little crude. With the rear cover removed, showing the, again rather crude, interior. The circuit board and distinctive "Klixon" keypad. The LED display is at the top. 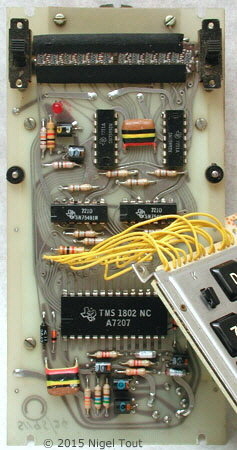 The circuit board with the first Texas Instruments "calculator-on-a-chip", the TMS1802.